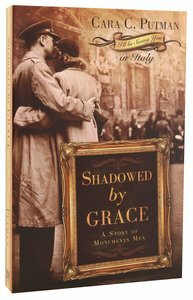 Shadowed by Grace is the first in a stirring new series of stand-alone historical suspense novels by acclaimed author Cara C. Putman. Desperate to save her dying mother, Rachel accepts her newspaper&'s assignment to travel to Italy to captures images dangerously close to the front lines of WWII.&#160;Her real motive &- to find the father she never knew -- an artist she hopes can offer the comfort and support both she and her mother need to survive. It&'s an unlikely situation for love and faith to flourish, but soon Rachel not only finds herself, but also her long-lost earthly father, and ultimately, the man her Heavenly father created to cherish and provide for her. About "Shadowed By Grace (I'Ll Be Seeing You Series)"
Stars in the Night is CARA PUTMAN's ninth novel and tenth book. An attorney and sometimes lecturer at a Big Ten University, Cara lives in Indiana with her husband and three children. Customer Reviews For "Shadowed By Grace (I'Ll Be Seeing You Series)"
I considered giving this book only two stars, but I liked the two main protagonists, so it slipped into three. However, the story is problematic. For a start, it's way too long. There are so many long, boring passages that go over the same ground again and again, especially concerning the relationship of the two leads and the female protagonist's back story, particularly the situation with her mother and father. While it's important to the plot, the continual going over of the basic situation with no plot advancement made it difficult for the story to hold my interest. Also, some scenes didn't seem to serve any purpose and some also seemed a trifle confusing in the way they played out. It could have been so much better. Rachel Justice is about to cross the Atlantic on HMS Queen Mary, bound for war-torn Europe, to photograph the fighting as America liberates Italy from the Germans. Her real motivation isn't to bring the war to the minds of her US readers--although that is part of it. She's going to Italy, in search of the father she never knew. Rachel needs to find her father because her mother is suffering from tuberculosis, and is likely to die soon without more medical treatment-treatment Rachel is hoping her father can help pay for. Lieutenant Scott Lindstrom is an officer in the Monuments, Fine Arts and Archives Division, better known as the Monuments Men. I'd never heard of them, so this was a pleasant surprise which elevated the novel from interesting into something more original, which I like. The plot works well on several levels, with the romance between Rachel and Scott developing as they spent more time together, supported by subplots of war, missing artefacts and Rachel's search for her father, and for faith. Overall, the book flowed well, and presented an original plot, likeable and interesting characters and an underlying Christian message. Recommended for historical fiction fans. Thanks to BH Books and NetGalley for providing a free ebook for review.